پس از نصب dnn با خطای زیر در logfile مواجه میشوم. 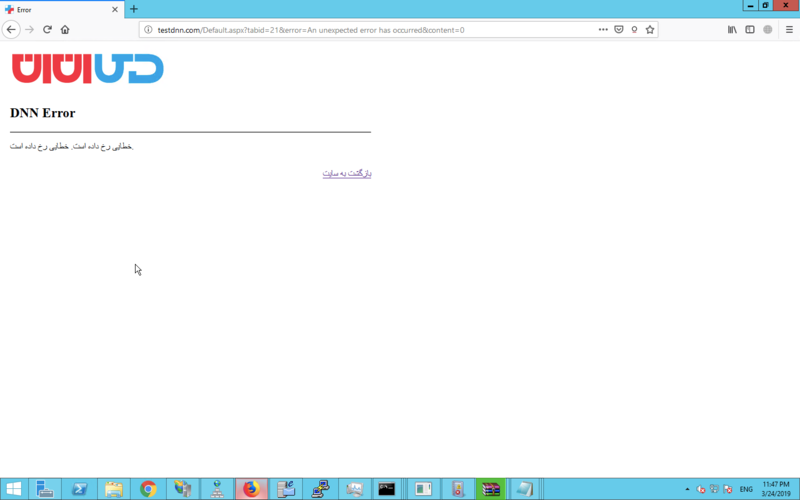 2019-03-24 23:33:48.888+04:30 [WIN-6RKN0H8TIS3][D:2][T:10][ERROR] DotNetNuke.Services.Exceptions.Exceptions - DotNetNuke.Services.Exceptions.PageLoadException: The type initializer for 'System.Web.Helpers.AntiForgery' threw an exception. ---> System.TypeInitializationException: The type initializer for 'System.Web.Helpers.AntiForgery' threw an exception. ---> System.TypeInitializationException: The type initializer for 'System.Web.Helpers.Claims.ClaimsIdentityConverter' threw an exception. ---> System.IO.FileLoadException: Could not load file or assembly 'Microsoft.IdentityModel, Version=3.5.0.0, Culture=neutral, PublicKeyToken=31bf3856ad364e35' or one of its dependencies. Access is denied. سایت بر روی plesk میزبانی می شود و application pool بصورت اتوماتیک ساخته میشود. زمانی که برای سایت application pool دستی میسازم و دسترسی iis_iusrs به دایرکتوری httpdocs می دهم مشکل برطرف می شود. ولی با هر بار ایجاد تغییرات سمت پلسک سایت به مشکل می خورد و down می شود.